This paper provides a review of work within the Generalised Likelihood Uncertainty Estimation (GLUE) methodology on estimating uncertainties in predicting flood frequency, flood inundation, and hydraulic transport of solutes in rivers and soils. The issue of prediction uncertainty as an input decision making is also discussed. It is concluded that in real applications it is unlikely that a fully objective approach to uncertainty estimation is possible. It is therefore important that the assumptions made are stated explicitly so that they can be agreed or disputed with the users of the resulting predictions. It is also important that the modelling process be considered as a learning process of constraining uncertainty by adding new information. Author(s): Bialik R., Czernuszenko W.
A numerical model for the random process of the particle impact and rebound from the regular channel bed based on Lagrangian approach is developed. This model reflects the balance of drag force, lift force, gravity, buoyancy, virtual mass force, Magnus force. Stochastic method of collision angle and bed-load velocity based on Monte Carlo simulation is used. Possible trajectories of various particles in an open channel flow are discussed. It is shown that the particle-bed collision mechanism depends on particle sizes and position at the beginning of saltation. An influence of the Magnus effect on saltation height is shown. Author(s): Boano F., Camporeale C., Revelli R., Ridolfi L.
The curvature of a meandering river influences both the level of the water surface and the topography of the river bed. This work discusses how the interaction between these two factors determines an exchange of water between the river and the hyporheic zone through the bed surface. An analytical solution for the exchange flux that is valid for low-curvature streams is presented. The model allows to describe the main features of the pattern of hyporheic exchange, and provides a useful tool to investigate the links between the river geometry and its effects on the ecology of the hyporheic zone. Author(s): Coufal R., Meyer Z. The paper presents a method of calculation of the grain diameter which should be used for the evaluation of sediment stream according to Ackers-White formulae. Based upon sieve curve for the sediment taken from the river bottom, the authors give the formula how to calculate Dopt which should be taken to the Ackers-White method instead of the recommended D35 which is not satisfactory. Author(s): Czernuszenko W., Holley E.
The aim of this article is to familiarize the readers (e.g., civil and environmental engineers) with the current statistical theory of turbulence for river flows. 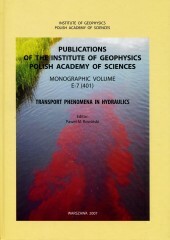 The authors want to give sufficient theoretical information not only for studying the specialized literature but also for experimental investigations on those environmental problems in which turbulence plays an essential part, such as erosion and sediment transport, resistance to flow, and pollutant dispersion. The paper describes comprehensive turbulence measurements in an experimental channel where instantaneous velocities were measured with use of a three-component acoustic Doppler velocity meter. The basic definition of the primary turbulence parameters as well as methods of estimating those parameters are discussed. Also, the fundamental relations for the primary velocity, the distribution of turbulent intensities, the Reynolds stresses, the autocorrelation functions, the turbulent scales, and the energy spectra are discussed. We report the results of laboratory experiments on the thermal bar propagation due to heating from the surface, performed in 2-m long water channel with bottom slope. Velocity and temperature fields in the presence of the 3.98oC are analyzed, demonstrating that (i) the dynamical front of the thermal bar is associated with the «nose» of subsurface jet, (ii) the subsurface jet accelerates with time, passing two phases in its development, (iii) speed of propagation of the thermal bar front in “fast” stage is close to that of a convective jet. This article describes an attempt to model the water flow velocity field for the Dobczyce retention water body. To solve the case, a finite element approach is used. Mathematical model and observational base are described, as well as their application to the problem. Potential difficulties are outlined. First results are shown along with the plans for further research and possibilities of practical applications of the generated data. Author(s): Henning M., Hentschel B., Dettmann T.
This paper presents an approach for the quantification of navigable waterdepths by applying a 2D-numerical model originally developed for automated waterways route planning to results of a physical bedload-model. Topography and water level data of the physical model of the River Odra with movable bed material are used as input for the model in order to determine navigable water depths as a function of river bed geometry. The methodology is proved successfully by comparing the influence of different maintenance strategies on shipping conditions. The results indicate also that the methodology may be used for the assessment of river bed stability. The article presents the results of empirical tests of the designed sewage transmission system in Warsaw. At the design stage, a number of questions appeared, pertaining to transportation of sewage in a siphon pipe. One of them was the question about the transportation capabilities of a geometrically graded system in the context of transportation of sewage which is a random mixture of liquids and solid particles of different origin. In order to analyze the phenomena, a laboratory model was built, whereon a number of experiments was performed. The purpose was to determine characteristic speeds: minimum non-silting, transportation, and minimum self-purification speeds. The research was preceded with a discussion on adoption of a criterion of similarity. Experiments were carried out on a physical model enabling visualization of the phenomenon, made of transparent pipes. The working liquid was a mixture of water and sand from the Vistula river. Verification measurements were also carried out, using sewage samples. Results of empirical tests confirmed the adopted assumptions and made it possible to make corrections in the design. Author(s): Koll K., Aberle J., Ettmer B., Hentschel B. This paper presents results from a preliminary investigation of the applicability of the random field approach to describe bed geometry in sand bed rivers. The investigations are based on high-resolution bed surface data of a physical bed load model of a longitudinal section of the river Odra. The first four statistical moments are used to describe differences in bed geometry which arise due to different river maintenance strategies and discharges. The results show the potential of the standard elevation of bed elevations as an indicator for vertical bed form dimension. It is shown that σz is correlated to discharge and may be used to describe bed form dynamical behavior during a flood wave. The average migration velocity of bed forms is estimated using cross correlation function. This paper presents the discrete vortex method as applied to the twodimensional flow problem. The method’s mathematical foundations are briefly summarized and its deterministic and stochastic formulations are given. The problem of boundary conditions for the simulation of flows in bounded areas is described. A way of satisfying the conditions through the potential flow solution and a procedure of generating vorticity on boundaries is provided. The efficiency of the deterministic and the stochastic method is demonstrated using as an example the two-dimensional unsteady flow around an obstacle in the shape of a square. Author(s): Krupka M., Wallis S., Pender G., Neelz S.
In recent years, the response to the threat of flooding has changed from a defence based approach to one of risk management. This has generated the need for very rapid simulations of potential flood event scenarios. The paper describes volume-based rapid computational method, and considers its application to an embayment of the River Thames in England. Comparison of results with those obtained using TUFLOW indicated that the rapid method could be improved by simulating friction effects by inhibiting the transfer of water between flood cells. Further results showed that under certain conditions the results of the enhanced rapid method were sensitive to the spatial representation of topography. Author(s): Kubrak J., Rowiński P.
The method for predicting the velocity and discharge in straight channels with smooth and rough banks using the eddy viscosity concept is applied to different sets of experimental results. The one-dimensional flow equation was solved using finite differences. Experimental confirmation of these theoretical results is presented for data from laboratory trapezoidal channels with smooth and rough banks as well as from selected actual river reach. Floods are one of the most important natural hazards for people, economy and ecology. Can disastrous floods be avoided ? No, and we are even unable to fully protect against these natural phenomena. However, research on the course and consequences of floods is helping us to mitigate their impact, and above all to avoid human fatalities. In recent years the number and frequency of floods considerably increased in Poland, Europe and over the whole world. An essential feature is the fact that floods appear in the most densely inhabited areas including river valleys. The paper presents changes in the approach to flood protection. Poland is the country where floods are very frequent and their origin and run are very differentiated. The approach to flood protection based on new Flood Directive of EU is presented. The paper concerns mainly floods in river valleys and urban areas. Author(s): Marklund L., Wörman A. Landscape topography is the most important driving force for groundwater flow and all scales of topography contribute to groundwater movement. Here we present results of how different scales of topography affect the groundwater flow at different depths. The study is based on a spectral analysis of the topography and a couple of exact 3-D solutions of the groundwater flow. We are also analyzing how different heterogeneities of the subsurface hydraulic conductivity impact the groundwater flow at different depths and alter the relative importance of different topographic scales on the groundwater flow. Quaternary deposits are extremely important for the infiltration at the ground surface, but the effect is primarily constrained to the deposit strata. Depth dependent hydraulic conductivity has a major impact on the size and depth of the groundwater flow cells, but it also affects the infiltration at the surface. Depth dependent hydraulic conductivity tends to counteract the effect of the large-scale topography on the groundwater flow more effectively than the smaller landscape scales. The results of experimental studies, aimed at the recognition of the scales of turbulent eddies in channels with the simulated riparian woody vegetation, are discussed in the paper. The analyses include temporal scales of macroeddies, longitudinal spatial scales of macroeddies, scales of Taylor’s microeddies as well as internal scale of turbulence by means of sizes of Kolmogoroff microeddies. To this end, flume experiments were used with model vegetation consisting of regular arrays of stiff vertical cylinders with variation in cylinder spacing employed. Different flow geometries were considered. Author(s): O'Donoghue T., Ribberink J. The paper presents an overview of results from large-scale laboratory experiments on sand transport processes under sea waves. The experiments, especially those carried out in recent years in the Aberdeen Oscillatory Flow Tunnel at Aberdeen University and the Large Oscillating Water Tunnel at Delft Hydraulics, provide insights into the underlying processes for both the ripple and sheet flow regimes. Insights and data from the experiments are used to inform the development of predictive models. The paper includes an account of recent modeling developments, especially of semi-unsteady models used for practical applications. Author(s): Osuch M., Kiczko A., Napiórkowski J., Romanowicz R.
A fluorescent dye-tracer study was performed under steady-state flow conditions on a 16.8 km reach of an anastomosing section of the Upper Narew River in order to better understand the solute-transport processes in a wetland system. The procedure consisted of the instantaneous injection of a known quantity of the solution of Rhodamine WT into a stream and observation of the variation in concentration of the tracer as it moved downstream. The paper describes the sensitivity analysis of a transient storage model applied to the experimental data. Special emphasis is given to ecologically related measures, such as estimates of the peak of tracer concentrations at cross-sections along the river and the length of time when the concentrations exceed specified threshold. This paper presents a macroscopic description of turbulent open channel flow above and within a rough permeable bed. The flow domain consists of two regions: the stream region above the bed, which contains only water, and a porous medium region within the bed, which contains both water and grains. The two regions are separated by a macroscopic boundary. The macroscopic description contains the double-averaged Navier-Stokes equations valid within the stream and within the porous medium, as well as the conditions for macroscopic flow variables at the interface. Author(s): Romanowicz R., Kiczko A., Pappenberger F.
This paper presents an alternative to distributed inundation models for realtime flood forecasting that provides fast and accurate medium- to short-term forecasts. The methodology applies a State Dependent Parameter approach to derive a nonlinear dependence between the water levels measured at gauging stations along the river. The transformation of water levels depends on the relative geometry of the channel cross-sections, without the need to apply rating curve transformations to discharge. The relationship obtained is used to transform water levels as an input to an adaptive, variable time lag routing model. The paper provides an account of the uncertainties involved and describes the conditions for its application. The approach is illustrated using an 80 km reach of the River Severn, UK. In the paper, flows in the uniform rectangular channel with a bypass are examined for three different geometries of junction zones. The 2D, depth averaged Navier-Stokes equations were applied to solve flow field. The special attention was focused on changes of water surface profile along a river reach and dis-charge split as a result of bypass channel introduction. Finally results of 2D modeling are compared with results achieved by simplified 1D model. An unsteady 1D flow model was developed for a channel with vegetated floodplains. The basic form of the non-linear St. Venant equations combined with retention effects of the vegetated areas on flood wave conveyance were used in the model. In this approach, friction caused by vegetation and additional resistance caused by interaction between the main channel and vegetated areas are taken into account. The Pasche method was used to calculate the total Darcy-Weisbach friction factor for each cross-section according to the type of vegetation and flow interaction between the main channel and vegetated areas. The model was applied to a 50 km long double trapezoidal channel, and the obtained results show variations of the water level, velocities, discharges, and friction factors depending on the type of vegetation in floodplains and the main channel. At high water stages the flow in groyne fields is highly affected by the water flowing over the groyne. For those conditions the groyne acts as an (im)perfect weir. In a similar way local elevations in the flood planes can be considered as weirs. The arbitrary orientation of those obstacles with respect to the flow prohibits the use of straightforward weir formulations. By considering the generic case of the flow over oblique weirs, a simple analytical approach already gives good insight and acceptable estimates, whereas a 3D numerical model clearly shows the complexities of flow separation and non-hydrostatic effects. Author(s): Van T., Carling P., Coulthard T., Atkinson P.
Bifurcations in river networks are key components of anastomosing river systems. However, most research has investigated bifurcations in meandering and braided river systems but not in anastomosing ones. In addition, numerical modelling has been mainly conducted for a single reach. This paper is to investigate the use of a numerical modelling approach (i.e. cellular automata (CA) paradigm) for a large bifurcation in the Mekong River system at the Siphandone Wetlands, Laos. The main characteristics of this river system are: (i) multiple complex channel; (ii) the combination of bedrock and alluvial river bed; (iii) flooding is quite fixed in terms of timing annually but extremely variable in terms of peak discharge; and, (iv) more than 60% of the river banks are unstable. The CA approach is relatively simple and has the ability to address some of the shortcomings of other types of numerical model. Via a CA model with a proper flow routing scheme, channel dynamics can be accounted, with the relevant prediction of inundation patterns, and water depths. The results show the application of a CA model for predicting the scale of flood inundation according to different scenarios of discharge from upstream. Finally, the discussion is used to argue how to successfully apply a CA model in such a complicated hydraulic system, as a bifurcation pattern. The ADZ model is a simple and effective tool for simulating solute transport in rivers. The study reported here concerns the model's numerical algorithm. Tracer data from the Murray Burn in Edinburgh is used to compare the performance of three alternative formulations. The theoretical advantages of a new algorithm are borne out by simulations of the tracer data, although improvements in simulations, compared to those obtained with the standard algorithm, are probably only significant when the problem is poorly resolved in time. Nevertheless, the new algorithm can be recommended on the grounds that little extra effort is required to use it and simulations so obtained are generally more robust. Author(s): Weitbrecht V., Jirka G.
To determine the mass transport characteristics in rivers, a Lagrangian-Particle-Tracking-Method (LPTM) based on random walk simulations has been developed. In a first step the accuracy of this model formulation has been tested using analytical results for horizontal shear flow in an infinite wide channel. To implement the effect of second order processes as they are given for example by the mass exchange with dead-water zones, a modified boundary condition has been introduced that allows to reduce the transport velocity of the tracer mass in the system. The model has been used to determine transport characteristics in a section of the river Rhine. The results are compared with tracer experiments that have been performed for different hydrological conditions.